I was out for a day with my 4 year old grandson. We went swimming at the local pool. Well, local for him, a 40 mile drive for me. It’s been a while since I was there last. About 13 years when his mother was 12. It was good seeing the old pool again. It hasn’t changed much. We splashed about for an hour or so in the warm pool, which is quite deep for him, he can’t touch the bottom and he spent most of the time swimming with his inflatable ‘wings’ on. All great fun, we played with every floatation toy we could find and I must have covered miles of swimming. Finally, we were all wrinkly and had had enough water sport for one day. Getting back to the changing rooms we got under the shower to get the chlorinated smell off. My grandson announced that he needed to pee and I went off to get dried and dressed. Nearly dressed, I realised that I hadn’t seen the lad for some time. It doesn’t take that long to pee, I thought, so where the hell is he and just what is he doing? A quick search of the showers and toilet drew a blank. The only place he could be was in the sauna. I opened the door to the said sauna. There were a lot of men in there. It’s a popular place for us old ‘uns. Sure enough, sitting right on the end of the lowest bench was the lad himself. ”What are you doing in here, young man?” I asked. “Sweating.” came the prompt and succinct reply. Every man in the sauna broke out in gales of laughter. I left him to it. Obviously the lad knows what he’s doing, even if I don’t. I had a bit of a shock a couple of weeks ago. I woke up with a real sense of discomfort emanating from my right testicle. Which was disconcerting, to say the least, as the right one is my favourite. Under the shower I had a good feel around and discovered a lump below and behind the ball. That’s not good, I thought. A lump and pain. I rang the doctor and made an appointment to get my nuts looked at by a professional. He took a peek and squeezed the offending nut. Pronouncing a verdict of ‘not sure’, he sent me to a clinic specialising in ultrasound examination. I had to wait for the exam as we were off on the cruise in two days. Cruise over, I met up at the clinic yesterday and had my balls looked at again. Scanning was quick and painless and, according to the pictures they received on the high definition screen, there is no tumor to be seen. However, the extra little bit that grows beside the actual nut may be a little inflamed. That bit has a weird name. It’s called the epididymis. And it isn’t too serious. Just annoying and at times, painful. Like you’ve been kicked ever so gently in the nuts. This, then, is treatable. I have to go back to my doctor and we’ll figure it out. It may have to be removed, but that isn’t serious either. One can live quite happily without one’s epididymis. So, I’m a little bit wiser now. A little more aware of my body and its functions. And wiser in more ways than just that one. I also know now, that is quite difficult to remain objective about anything when your balls are being fondled by a pretty young nurse…!! My wife’s idea. She thought we needed a break and booked a trip round the Baltic Sea. With all the trimmings and a get-anything-you-like-on-board-for-free card, we paid a bargain price because the ship had cabins left unbooked. Always had an eye for a bargain my missus, which is why I married her and she married me. We packed all our best gear and duly boarded the MSC Sinfonia at 14.00 hrs. on a sunny Saturday afternoon in Copenhagen. We got aboard early to avoid the hordes and spent the afternoon exploring the floating hotel. I decided to avail myself of the freebie card in one of the bars. It worked. All the booze I can swallow for zero money. And food. Cakes. Ice cream. You name it. Whip out the card and sign a receipt for 0.00. Brilliant. We had booked our evening meal for as late as possible, which was a good thing as we had to practice emergency mustering at the lifeboats at 19.15. We had to grab our lifejackets and muster at muster point G. Here, you put your lifejacket on and practice standing around under the lifeboat for a half hour. I got bored by the standing around and thought I’d cheer the mustering guy up. 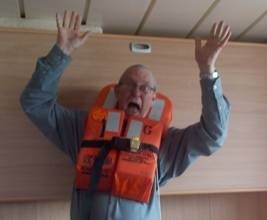 ‘’My wife wants to know if these life jackets come in any other colours as this one doesn’t match her shoes.’’ He didn’t seem to find that funny. Nor did he seem to appreciate my running round the muster station shouting ‘’We’re doomed, we’re doomed. We’re all going to die.’’ One or two of the others at muster station G did though and conversation was attempted. No sooner started than finished, we had all passed the mustering test and we were dismissed to return to normal cruising activities. This meant dinner and more free booze. Surprisingly, after all the free food and beer I had consumed during my afternoon recce, I wasn’t too hungry but once I got started on the soup I decided to do my very best and ate a hearty four course dinner just to please the missus. Dinner done, we went off to try the cocktail bar and casino. Many free cocktails later, we called it a night and went off to bed. During the night, the ship moved and we woke up in Germany. Having arrived in Northern Germany we disembarked into a popular seaside resort and glorious sunshine. In fact it got to be very hot and sticky so we didn’t stay ashore for more than a couple of hours. It was the local town festival week so the whole affair looked as if a circus had invaded and occupied the town. Being a Sunday, the local shops were mostly closed and those that had opened were tourist traps. It was hot. We took a liquid lunch. Back on board ship we took a tour round the bars and ended up in the pub. One can smoke in the pub. Only one minor incident to report. As I was explaining to the barman where we would be sitting, I stretched my arm out to my side and pointing with one finger, I accidentally poked a passing waitress right in the eye. She took it all with a teary smile and I was hard pressed to apologise enough to the poor girl. We drank our drinks and beat a hasty retreat to our cabin. From there on, it was dinner and cocktails all evening and finally off to the land of Nod. As we sailed we encountered the worst thunder storm I have ever witnessed at sea and the good ship Sinfonia was hit by lightening at least 3 times during the night. The noise was ear shattering and the lightening was absolutely spectacular. Day three is a sea day. We are heading North towards Stockholm. I am presently trapped in a bar with free booze.. The weather is not good so the day gets broken up by breakfast, shopping, bar, lunch, bar, bar, nap, dinner and bar. All ashore and walk round in a gale punctuated by rain and sunshine. 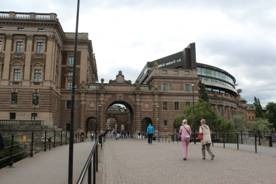 I’m sure Stockholm is a pleasant place to be in the summer sunshine but we didn’t experience that. My eyes were sandblasted and I found the wind cold and unpleasant. My dearest had to buy a jacket to keep warm. 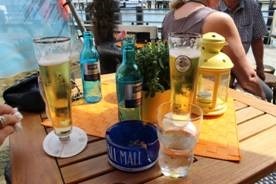 We shortened our shore leave and returned early to the boat and visited the bar. Again, the weather wasn’t good. The old town is beautiful and is the tourist trap one expects it to be. My watch strap broke and I found a watchmaker who effected repairs. Some of us went shopping again and I didn’t. 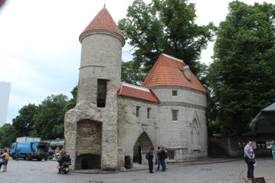 I did enjoy being in Tallin though and may be tempted to return at some later date. Back on the boat, we went for dinner at eight p.m. I am not impressed by the Italian kitchen. I ordered the beef and expected a nice piece of meat, well cooked and with some trimmings. What I got amounted to three pieces of undercooked dead cow and some fancy vinegary, oily sauce lovingly prepared by a chimp. While I’m on the subject of food, breakfast leaves a lot to be desired. The continental is easy enough being a bun with meat, cheese, cereal and so on. The English breakfast is virtually unrecognisable. How hard can it be to open a can of beans and make some toast? There are beans. Not baked as we know them. No. These are some delicate foreign exotic beans, plucked from beneath the hooves of stampeding llamas and lovingly soaked in olive oil and prepared by an overpaid egoist chef who believes he is the world authority on beans. I have news. Heinz nailed it years ago. Give up and accept it. I am also convinced the sausages are made of goat meat and the bacon leaves a lot to be desired. An egg is, thankfully, still an egg. Hard to mess that up but that doesn’t stop them trying. The eggs get fried in olive oil. This ship is populated by Italians. They are noisy in the extreme and equally as impolite. At the buffet, they behaved like pigs at a trough, pushing others away and snatching food from the plates as opposed to simply taking what ever one wants in a reasonable and orderly fashion. Their children display a complete lack of discipline and are given to loud violent tantrums. ‘’Hamburger Paradise’’ isn’t. It is purgatory. The buffet is free for all and is a ‘free for all’. Beware stampeding Italians. I have checked my personal indexes. Beer down, cocktails up. Tea down. Chocolate and cake both critically low. St. Petersburg. Or Leningrad, as I like to call it. I never thought I would set foot in Russia. The old adversary. I spent eleven years ready to visit violence upon this country. Today, I came in peace. Lucky for them. 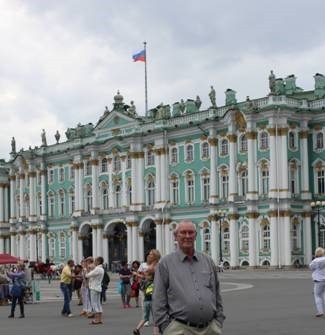 Just to prove it, here I am outside the Winter Palace unarmed and not being extremely dangerous. Surprisingly, a pleasant place to be. I saw the Winter Palace and took a lot of pictures. The place reminded me of Budapest or Prague. People looked well fed, affluent and well dressed for the most part. Gasprom owns the town and has seriously polluted the river Neva. Have I seen the cultural high point of Russia? No shopping here as we had no visa and were reliant on the pre-arranged ship tour. We were driven round the city and herded like sheep through a souvenir emporium. Free vodka. The sun shone briefly. One of the forty days of Sunshine this city gets each year..
Dinner on board with a nice German couple, Dieter and Christine. We’d met them in the cocktail bar earlier and had a bit of a cocktail and whisky party with them. Great fun. A day aboard as we sail, homeward bound, to Copenhagen. We are due to get there at about midday tomorrow but are not to be disembarked until about quarter past one tomorrow afternoon. The weather is awful. Cold and windy. Spent most of the day relaxing in our cabin. Packed most of our gear. Gala night in the restaurant tonight. I wonder how many tee-shirts I’ll see there. There is always a dress code. I have tried to respect it. Not all of my fellow travellers do. Uncouth commoners, they should be sent from the restaurant and told to dress accordingly. Dinner was followed by more free cocktails and a late night. Which may have been a wrong move as we had to get up early the next day. Finally, as we arrived in Danish waters the following morning, the sun came out. Welcome home. Apart from the uncontrollable weather, which wasn’t good to us, the whole experience was rather good. Most of what the restaurant dished up was very good and the wine selection was great. The crew and cabin staff, bar staff and everyone that ran about fulfilling our needs were cheerful and well trained. The restaurant service was tip-top. Days on board ship can be a bit boring but if you can find a watering hole and a little entertainment for the afternoon, you’ll be OK.
Get a balcony cabin. Living in the belly of the ship would be claustrophobic after a few days. Would I do it again? Yes. I might choose a different company to sail with but the whole idea of cruising is to travel to as many lands as is possible in the run of a comparatively short time with as little effort as possible. Travelling while you sleep is an excellent way to do just that. We may not have seen much of the countries we visited but one can get the idea that one isn’t done with the place. For example, I may just have to go back to Russia and Estonia at a later date. There is more to see. If you like being pampered to any degree, then try a cruise.